Swaps shooting for precision 3D platforming. 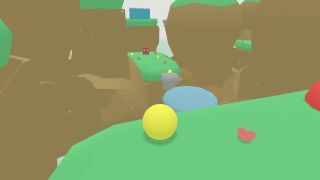 Lovely Planet was a wonderfully colourful, speedrunning first-person shooter/platformer, while its sequel Lovely Planet Arcade ditched the y-axis and focus on platforming, to put more emphasis on the business of shooting stuff. That trend for reinvention continues in the third entry, Super Lovely Planet, which has just released on Steam and the Humble Store. "You don't unlock any skills or abilities. There is only the jump button." "NPCs don't keep you for too long. They don't beat around the bush or waste your time trying to be funny." "You don't defeat an 'evil mastermind'. There's no boss fights." "I have ideas for Lovely Planet 2. I also have a prototype ready." "Look, I can't really explain why it's not a shooter game. I wanted to make a platformer, so I made a platformer. Okay?" "You're still reading this? Pro tip - there is in fact a second jump button the game never tells you about." Super Lovely Planet is out now, with a 25% discount for the next few days.